Transport in Ukraine includes ground transportation (road and rail), water (sea and river), air transportation, and pipelines. The transportation sector accounts for roughly 11% of the country's gross domestic product and 7% of total employment. Today the transport sector in Ukraine generally meets only the basic needs of the economy and population. The level of safety, quality and efficiency of passenger and freight transport, as well as the infrastructure's amount of energy usage, and the technological burden it places on the environment do not meet modern-day requirements. Due to the low level of demand, the country's existing transit potential and advantageous geographical position is not fully utilised. There is thus a lag in the development of transport infrastructure, transport and logistics technologies and multimodal transport. All this has made Ukraine uncompetitive as the high costs of transport across the country make the cost of production in the country uncommonly high. European Transport Corridors - Caucasus - Asia (TRACECA) and Europe - Asia. The share of the transport sector in Ukraine's gross domestic product (according to Goskomstat) as of 2009 was 11.3%. The number of workers employed in the sector is almost 7% of total employment. The transportation infrastructure of Ukraine is adequately developed overall, however it is obsolete and in need of major modernization. A remarkable boost in the recent development of the country's transportation infrastructure was noticed after winning the right to host a major continental sport event the UEFA Euro 2012. In 2009, Ukrainian infrastructure provided for the transportation of 1.5 billion tons of cargo and 7.3 billion passengers. As the global financial crisis took hold and demand for major export commodities in 2009 fell, the volume of freight traffic decreased by 17,6% when compared with figures from 2008; passenger transport fell by 12,7%. A sleeping train in Ukraine's Crimea region. The length of the railway network Ukraine ranks third in Europe (21.7000 kilometres of track). Ukrainian trains and trackway are incapable of speeds more than 160 kilometres per hour. However, the number of railway passengers and freight climbs. The government made huge investments in the railways in preparation for Euro 2012. There are intercity trains between Euro 2012 cities (Kiev, Lviv, Kharkiv and Donetsk). However, there is currently not enough line capacity provided on routes to the south and the Crimea. Section of the M05 highway near Kiev. The development of public roads in Ukraine is currently lagging behind the pace of motorisation in the country. During 1990-2010 the length of the highways network hardly increased at all. The density of highways in Ukraine is 6.6 times lower than in France (respectively 0.28 and 1.84 kilometres of roads per square kilometre area of the country). The length of express roads in Ukraine is 0.28 thousand km (in Germany - 12.5 thousand kilometres in France - 7.1 thousand kilometres), and the level of funding for each kilometre of road in Ukraine is around 5,5 - 6 times less than in those locations. This is due to a number of objective reasons, including that the burden of maintaining the transport network per capita is significantly higher than in European countries because of Ukraine's relatively low population density (76 people per square kilometre), low purchasing power of citizens (1/5 of the Eurozone's purchasing capacity), relatively low car ownership and the nation's large territory. The operational condition of roads is very poor; around 51.1% of roads do not meet minimum standards, and 39.2% require major rebuilds. The average speed on roads in Ukraine 2 - 3 times lower than in Western countries. As of 2016, many of Ukraine's major provincial highways are in very poor condition, with an Ukravtodor official stating that 97% of roads are in need of repair. The road repair budget was set at about 20 billion hryvnias, but corruption causes the budget to be poorly spent and overweight trucks are common place rapidly causing more road damage. Paved: 164,732 km (102,360 mi) (including 15 km (9 mi) of expressways); note - these roads, classified as "hard-surfaced", include both hard-paved highways and some all-weather gravel-surfaced roads. Currently there are three major new airport terminals under construction in Donetsk, Lviv and Kiev, a new terminal has already opened in Kharkiv and Kiev's Boryspil International Airport has recently begun operations at Terminal F, the first of its two new international terminals. Ukraine has a number of airlines, the largest of which are the nation's flag carriers, Aerosvit and UIA. Antonov Airlines, a subsidiary of the Antonov Aerospace Design Bureau is the only operator of the world's largest fixed wing aircraft, the An-225. Donetsk Airport destroyed due to War in Donbass. New terminal at Odessa International Airport has been opened for arrival flights on April 14, 2017. Major airports are: Kiev Boryspil Airport, Dnipropetrovsk Airport, Kharkiv Airport, Lviv Airport, Donetsk Airport, Odessa Airport, and Simferopol Airport. Passenger terminal of the Kiev River Port. 1,672 km (1,039 mi) navigable waterways on 7 rivers, most of them are on Danube, Dnieper and Pripyat rivers. All Ukraine's rivers freeze over in winter (usually December through March), limiting navigation. However, river icebreakers are available on the Dnieper, at least in vicinity of Kiev. The most important waterway of Ukraine. Dnipro within Ukraine is a regulated system of reservoirs separated by dams with shiplocks. The river is navigable through all its Ukrainian length. Notable riverport Chernobyl is now abandoned due to the Chernobyl disaster, but the waterway retains its importance as part of the Dnieper–Baltic Sea route. Plans are announced to revitalize commercial freight navigation on the Southern Bug as part of the increasing grain export from Ukraine. Port of Odessa on the Black Sea is the largest seaport in Ukraine. As of July 2013, Ukraine had 18 "marine trade ports" available for foreign ships' entry. Some of these "marine trade ports" are actually port conglomerates comprising several non-adjacent ports and tenant private terminals. Major river ports are also considered[by whom?] "marine" international ports. 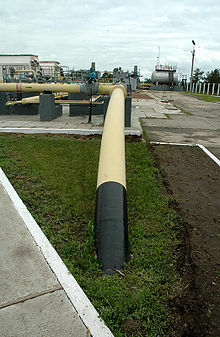 The natural gas transport-system can take in a maximum of 288 billion cubic meters of natural gas per year. Its annual output capacity is 178.5 billion cubic meters, including 142.2 billion to be forwarded to European countries. ^ "2E +% C2% E0% ED% F2% E0% E6% ED% B3 +% F2% E0 +% EF% E0% F1% E0% E6% E8% F0% F1% FC% EA% B3 +% E0% E2% F2% EE% EF% E5% F0% E5% E2% E5% E7% E5% ED% ED% FF & path =.. / Database/Regiostat/13/01 / & lang = 1 Freight and passenger road transportation in Ukraine". stat.lviv.ua. ^ Industrial railways and metros in cities are managed independently. ^ Dan Peleschuk (16 June 2016). "Ukraine's Broken Road to Europe". Foreign Policy. Retrieved 17 June 2016. ^ Patkevich, Kostyantyn; Sobko, Dmytro. "Kharkiv airport gets new terminal". Retrieved 11 Sep 2013. ^ "New terminal launched at Odesa airport - Russian aviation news". Russian Aviation Insider. 2017-04-19. Retrieved 2018-06-09. ^ "Киевскую дамбу может разрушить только метеорит или война — Эксперт". www.segodnya.ua. ^ Warrick, Joby (8 September 2013). "Ukrainian port eyed as analysts seek Syria's arms source". Washington Post. Retrieved 9 September 2013. ^ "Port of Oktyabrsk". World Port Source. ^ "Парковая страница Imena.UA". www.hydrography.com.ua. ^ "Єжель вимагає повернути Україні маяки в Криму". comments.ua. ^ "Official website of the Maritime Security Agency". dp-amb.kiev.ua. Archived from the original on 2013-08-21. ^ "Про затвердження переліку суднобудівних підприємств, для я... - від 21.12.2005 № 1256". zakon4.rada.gov.ua.